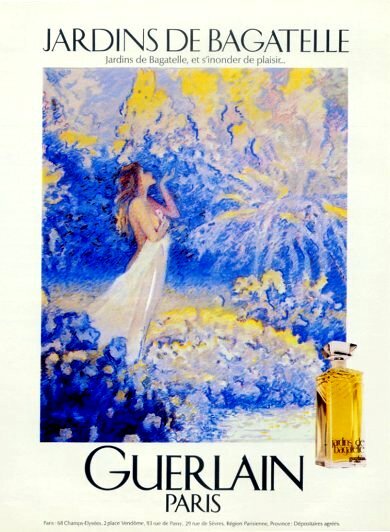 Jardins de Bagatelle by Guerlain: launched in 1983. Created by Jean-Paul Guerlain. The name was taken after a beautiful garden in Paris located at the Bois de Boulogne, a chateau built in 1775 by the Comte d'Artois as a hunting retreat. The elegant garden is most known for its lush rose blossoms and the name "bagatelle" simply means "a thing created for pleasure", a trifle. "Jardins de Bagatelle is for women who always perfume themselves for the pleasure of seduction as well as for their own pleasure and enjoyment. Jardins de Bagatelle blossoms over a tuberose base. This raw material also has aphrodisiac powers. In the time of Louis XVI, its scent filled the air in the King's court to identify any unwed pregnant women: these women would faint under the effect of this poisonous flower!" First issued as an eau de toilette only, but the line was expanded to include bath and body products by 1986 and an eau de parfum in 1993. Jardins de Bagatelle was one of the Guerlain fragrance lines that did not include an extrait (parfum). So what does it smell like? It is a true 80's style powerhouse fragrance bursting at the seams with an opulent explosion of white flowers on a woodsy base of cedar. Sometime in it's life, Jardins de Bagatelle was reformulated with modern ingredients. After reading various reviews for the fragrance over the years, some people have claimed that the newer version lacks the earthy qualities of the vintage formula and seems to be a bit more brighter in character. Saint-Gobain Desjonquères and Pochet et du Courval. 60 ml Spray - June 1983 production until August 1996. But by 2013, this bottle was replaced by the bee atomizer bottle. Abandoning the late 1960s- early 1980s white and black zig zag box design for the black and gold box design that began with the introduction of Jardins de Bagatelle, Guerlain adopted this design to package fragrances which became the signature box style for the rest of the 1980s up until the early 2000s.